To ensure that my students understand allusions (and can laugh at Far Side jokes), I’ve always required them to study cultural literacy. We spend just a minute or two each day going over the day’s term. We discuss terms in categories such as Mythology/Folklore, Psychology/Sociology, World Religions, Idioms, Proverbs, Arts/Entertainment, Philosophy/World Literature, and Bible. At the end of each category, I give a cultural literacy test. Usually, I have students draw six terms from a bucket and write everything they know about five of them. Over the years, I’ve kept a collection of funny responses. The ones below are all actual answers high school freshmen gave on the Bible category test. Job had lots of patients. God tested Job to see if he was really fateful. Sodom and Gomorrah were two cities full of since. A snake came to Eve, but he was really Satin. The Lamb of God was cursived for our sins. Soldiers put a crown of thorns on Jesus’ head and moked him. Samson and Delilah were two brothers. Sodom had very long hair. Samson was a strong man, and Delilah was the giant he killed. Cain and Abel taught us how to get along well with others. Judas told the Punish Pilot where Jesus was. The Beatitudes were the twelve disciples. Armageddon was the end of the world. In next week’s blog, I’ll provide you with some of my cultural literacy lists and with details about how I implement them. For now, though, I hope you enjoyed some Cultural Literacy Humor! Get Thee to a Conference! Have you attended a professional conference lately? NCTE, IRA, HSTW, AMLE, NAGC, NAIS, NAEP, ASCD, NBCT, ATEG . . . there are so many choices. As a teacher and curriculum author, I have attended countless professional conferences in the past 25 years. Professional growth is crucial for all educators. Taking graduate classes and working on my National Board Certification helped me become a better teacher by forcing me to evaluate my practices and by reminding me of what it means to be a learner. Conferences are a great way to enjoy similar experiences without the long-term commitment and expense! I like attending practical sessions that motivate and prepare me to implement new strategies in my classroom. National conferences provide a wide range of valuable sessions. Although state conferences can't offer as many different choices, I've found that the sessions they do schedule are often more applicable and less theoretical. If you've never presented at a conference, consider doing so. Professionals should want to share with other professionals. And your school system might be more willing to pay your conferences expenses if you present. While national conferences usually have earlier proposal deadlines and accept a smaller percentage of proposals, state conferences provide an easier (and less intimidating) avenue for becoming a presenter. I always discover quality, innovative resources while wandering through the conference exhibit hall. Yes, I can look at just about any educational resource online. I can even peek inside books and read reviews by other readers online. But in the exhibit hall I discover products I might have never known about otherwise. I also get to put my hands on the books and other classroom materials. I like to speak to the representatives at the booths. Granted, their goal may be to sell me their products; but as experts on the materials they sell, they can also answer my questions. And I can peruse the products in their entirety and get a better feel for the overall philosophies of the companies. Exhibitors give away lots of free stuff, too! Often I make positive and meaningful connections with other professionals at conferences. I have maintained friendships with many of these educators over the years, and we enjoy reunions each time we find ourselves at the same conference again. In fact, at one recent conference, I reconnected with a former student who is now a teacher herself! Hearing about her classroom experiences inspired me and reminded me that, one way or another, we are all preparing each one to teach one. School budgets are tight, and many teachers are experiencing pay cuts and furloughs. But if you haven't attended a professional conference lately (or ever), make every effort to do so. I recently met a teacher from Trinidad and Tobago who attends a national conference every ten years because that's how long it takes her to save up for the next one! Don't want to wait ten years? Look for a less expensive state conference or even a national conference coming to a venue near you. Drive in each day to save on hotels, airfare, and food. Driving also allows you to haul home more freebies from the exhibit hall. I've brought back tables, desks, and more books and posters than I can count--just one more benefit of attending a conference! If you've ever visited DGP Publishing at a conference, you've probably seen this shirt. For a chance to win one, post a comment telling readers what YOUR favorite professional conference is and why! 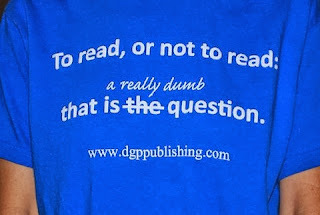 By the way, DGP Publishing will be at NAGC, AMLE, and NCTE in November 2013. Please stop by and say hello! It's in the (Word) Bag! Have you ever heard that one person’s junk is another person’s treasure? Does that expression make you think of a garage sale or a thrift store? It makes me think of junk mail. We all get it; we all dislike it! All that paper junk probably goes from your mailbox to your trash can. Well, read on and you will never think of junk mail in the same way again. Step one: Start collecting your junk mail or old magazines. I keep mine in a box or bag. Nobody dares to throw away any junk mail in my house until I have looked through it. You could also have your students bring in junk mail or have parents help with this project. Step two: Go through the mail or magazines and look for words that are at least a half inch tall. Cut out those words and put them in another box/bag to save for step three. Look for words that represent all parts of speech, and are in different colors and a variety of fonts. When you have gathered up a good-sized collection, you are ready for the next step. Step three: Glue the words onto pieces of colored copy paper. Use a variety of different colors. Try to glue them on in straight rows with a little space in between the rows and the words. This allows you to get more words on the page and will make step five easier. If you use a glue stick, the process will go much faster. You don’t need to glue down all the corners. Just give it one swipe and slap it down. I also look for punctuation marks or print some from my computer. Step four: When you have accumulated a stack of pages, have them laminated. You need to hunt for a school supply store with a laminator if you don’t have one in your school. Having it done at an office supply store can get a little expensive. Step five: Cut out the laminated words. Don’t cut too close to the words because they could peel apart. Start filling up your Word Box/Bag that you will use for many activities in your classroom. Step six: Once you have a good-sized box/bag of words, you are ready to use them with your students. Put students in small groups, and give each group a handful of laminated words. It is a good idea to let the kids have some exploring time with the words before you ask them to do specific activities. Kids of all ages and ability levels enjoy using these words because they are colorful and interesting. After the exploration time, what can you and your students do with the words? 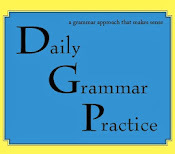 Here are some activities that will help the students improve their grammar and writing skills, practice reading, and see how words can be fun. 3. All Levels: Divide students into groups of 3 or 4. Give each group a handful of words. Have students put the words into categories of noun, pronoun, adjective, verb, etc. (depending on their skill level). 4. All Levels: Divide students into groups of 3 or 4. Give each group a handful of words. Have students use the words to make sentences, paying attention to subject/verb agreement, pronoun usage, etc. Share these sentences with the rest of the class. 5. Elementary to Upper Level: Hand one word to each student, and have all students walk around and find other students with words representing the same part of speech. After sorting, have them find other students whose words can combine with their own to make sentences. 6. Elementary to Upper Level: Divide students into groups of 3 or 4. Give each group a formula for building a sentence. Each group uses words from the box/bag to make a sentence using that formula. 7. Middle to Upper Level: This game is played in partners. Each player draws 10 words from the box and then tries to make a sentence using as many of his or her words as possible. (The sentence can be silly as long as it is a real sentence.) The students earn a point for each word in their sentence. A bonus of ten points is given for using all the words. Play continues for a specified period of time or until players reach a predetermined number of points. 8. Middle to Upper Level: Divide students into groups of 2 or 3. Each group draws a word and tries to use it in as many different ways as possible. For example, paper could be used as a noun, a verb, or an adjective. Each team receives one point for a correctly identified part of speech and can accumulate points over several rounds. Watch your students have fun with the bright, colorful, and varied words while increasing their reading, writing, and grammar skills. And remember—junk mail doesn’t have to be junk. This is the third and final post in a series about engaging, creative assignments that can be used with your choice of literature. These assignments will get your students writing as well as thinking critically about themes, characters, setting, mood, etc! Here are five ideas for this week. Be sure to look back at the last two posts for more! #11. Nothing in his life became him like the leaving it! Write an obituary for each character that dies in the play, novel, etc. If you’re not familiar with obituaries, read a couple from a local newspaper to see how they’re set up. This assignment isn’t too challenging but encourages students to think about characterization as well as plot elements. #12. Choose a character from (your choice of literary work) and draw an illustration that represents him or her. Here’s the catch: Your picture can’t be of the actual character. It must be some kind of abstract art that represents the character. Attach your illustration to a paragraph or two that explains why you illustrated the character the way you did. Be specific. Here are a couple of student examples. The first one includes the written explanation as well. Students create their own symbolism in this more advanced assignment, and they focus on characterization as well. #13. Choose a character from the novel, play, etc. Pretend to be that character, and create a scrapbook page about a particular event from the novel, play, etc. Be creative. Include pictures, mementos, journaling (that’s writing about the items on the page or about the event), and anything else you can think of that would be appropriate. Here is a student example. This assignment makes students consider tone, mood, characterization, plot elements, and even setting. #14. If all the world’s a stage, you must have costumes! Choose a character from the play, novel, etc. and create a costume or costume part for him or her. You can make your piece from fabric, cut it out of paper, or use recycled household objects—whatever works! Don the costume, take a picture, and attach it to a paragraph explaining why you chose this particular costume for this particular character. Why this design? Why this color? Explain it all! And feel free to wear it to class! It’s amazing how much fun students have with this remake of the old elementary school book character day. I’ve had everything from a pair of cross-gartered yellow stockings (Twelfth Night) to chains (A Christmas Carol) to a red “A” (Scarlet Letter). Some even wear their costume pieces around school all day! #15. The game is afoot. Create a board game for (novel, play, etc.). Make it really relevant to the literature and include some elements of skill so a player has a better chance of winning if he or she has read the work. Bring in the game along with necessary pieces and directions so we can play. Here is a student sample. This game encompassed several different Shakespearean plays, but most students base their games on just one novel or play. Either way, students must have a complete understanding of the work to produce a quality game, and they have a great time playing all of the games when they’re finished. I keep a collection of dice, pawns, spinners, etc. for them to use if needed. I hope you have picked up a few new ideas in these past three posts. We’ll be moving on to a different topic next week, so be sure to come back! This is the second in a series of posts about engaging, creative assignments that can be used with your choice of literature. These assignments will get your students writing as well as thinking critically about themes, characters, setting, mood, etc! Below are five ideas for this week. Be sure to look back at last week’s post and check back next week for more! #6. Produce a (your choice of novel, play, etc.) newspaper. Include things like obituaries, advice columns, pictures, articles, comics, horoscopes, opinions, puzzles, advertisements, play reviews, recipes, etc. The sky is the limit, but be sure to capture the tone of the (novel, play, etc.). Have some fun! Here are a couple of student examples. I love how creative the students get with this assignment, and they really have to think about all aspects of the literary work. I've even had students submit their newspapers in plastic newspaper bags! #7. To be or not to be: that is just one of the questions. Pretend you are a magazine or newspaper reporter. Choose a character from (novel, play, etc. of your choice) to interview. Write out your questions and the character’s responses. The topics for the questions are up to you but should be somehow related to the literary work. This assignment forces students to think about characterization as well as the details of the plot. Some students enjoy recording the interviews. #8. If music be the food of love, write a song! That’s right. Pretend you’re producing (Title of Literary Work), the Musical. Write one of the songs that will be in the musical. Be sure to tell who sings it. It could be a solo, a duet, or even a song for the whole cast. It might be fun to borrow a melody from another song—or even write your own accompaniment—and actually sing your song, but that’s optional. It should have some musical qualities either way, though. Here is an example of a CD cover a student made to go along with this project. He wrote lyrics for only one of the songs listed, but just coming up with titles required critical thinking. Some of my more musically gifted students have put their lyrics to music and performed their songs for the class! #9. Get a job! Choose any character from the (novel, play, etc.). Decide what type of career would suit that character, and write a resume for him or her. You’ll have to get really creative for this one! Make up information if you need to, but stay true to the character. This assignment obviously focuses on characterization, and it requires students to really dig into the text for relevant details. It also has a practical application for older and/or career-minded students. #10. Ready for a little comic relief? Choose a scene from (literary work of your choice) and write it up like a comic strip. While it isn’t necessary to include all of the lines (or dialogue) from the original text, your comic should capture the gist of the scene. Can’t draw? Stick figures and clip art are fine! Or try www.makebeliefscomix.com. This is a more basic assignment, but students still have to synthesize the plot, characters, and tone of the work. The student who created the second sample below used makebeliefcomix.com.